* Crisp lavender and sweet cinnamon are quite exhilarating together on the top. * It starts like a refreshing and manly sports scent – or what I wish a man’s sport scent would smell like, rather than generically clean and fresh. * Out of nowhere, a soapy rose comes into play- with some of the cinnamon giving it a prickly feel. * The rose blossoms literally by feeling really alive, as if it is breathing. * If you sniff your skin closely, you smell the base of woods and nondescript musk. 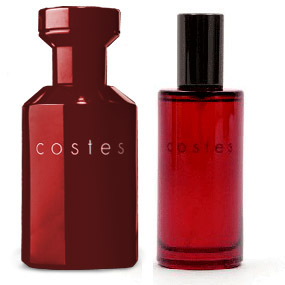 Costes is available at LuckyScent and CO Bigelow.